Category is: tropical flowers. (Can you tell I've been watching Ru Paul's Drag Race? 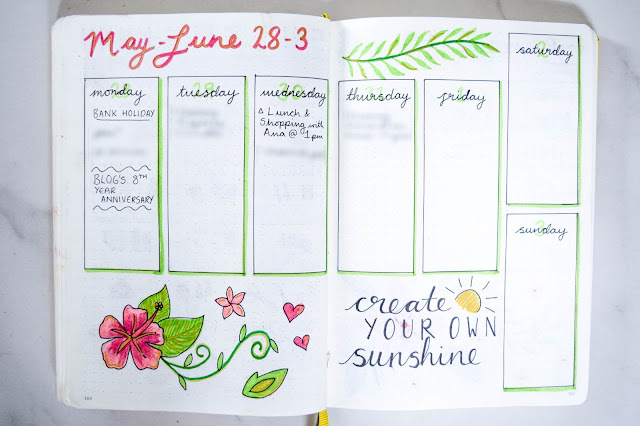 lolz) This month I chose to brighten things up in my bullet journal, especially after last month's dreadful theme which was so bad I couldn't bring myself to share the mistake of May's set up. 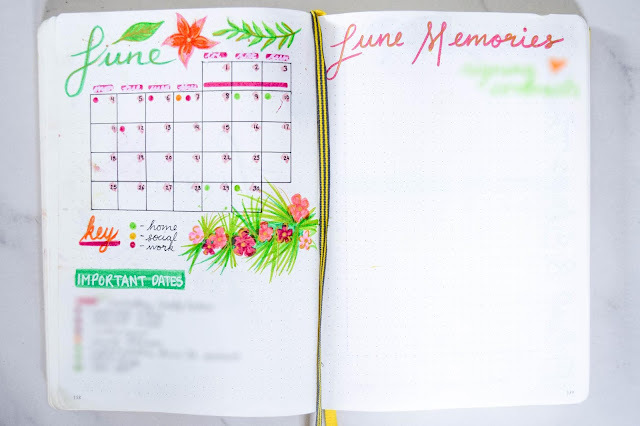 I didn't really use my bullet journal last month but I really wanted to pick things up again and so spent some quality time making this month's pages. I messed up in a few places (as you can probably tell from the intro page) but alas, it's better mistakes than the blue/yellow mess of May. For the intro double spread I did my usual month title on one side and quote on the other. 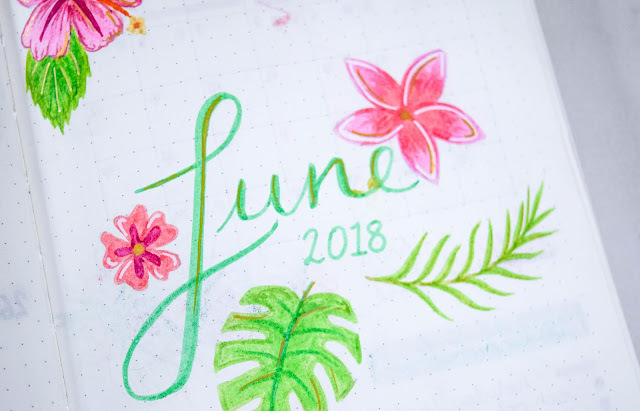 I bought some new metallic and white pens the other day and decided to use them for this month's tropical flowers theme. I guess I forgot to wait for the gold to dry before moving on to another page. I smudged the gold onto the other page and then when I was rubbing the pencil lines away from my quote, I smudged the ink there. 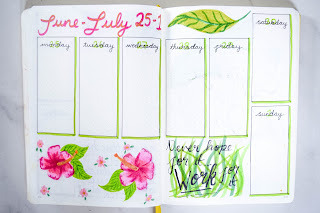 Not a great start but I still like the pages because I took a little extra time to make the flowers and blend the colours. For my monthly overview I have kept to the same layout. It's always worked well for me and now that I've found a format that I like, I've decided to keep it running through my journal. I can still do a lot with it and I love that it fits on one page. I also added my usual memories page on the other side to note down things that have happened, quotes from things said over the month and other memorable moments. These are usually my favourite pages by the end of the month. I always love the way they look when it's complete! 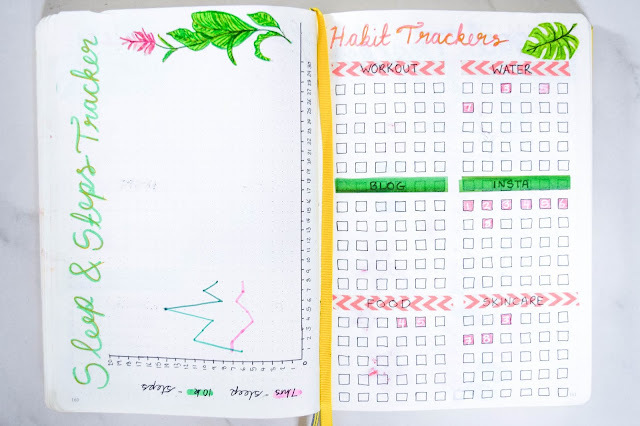 This month's trackers are just like before except I tried a new layout for the habit tracker page. I was Pinterest searching new ideas because I still haven't found a layout I really like yet and thought I would try this one. I'm not digging it and actually, I messed it up. I started sketching it out too far down so I didn't have enough space to put all the boxes in and so the bottom ones come off the dotted grid. I also accidentally started outlining the boxes before realising that I didn't have 30. I had to rejig the boxes and add the washi tape to hide my mistakes. That's when I found out I started too low! Oops. I like my mood tracker this month. I think it's nice and simple but still matches the theme. I don't think mood trackers have to be too detailed. There are lots of amazing mood tracker ideas out there to use if you did want something fancier but I like simplifying mine just a little bit so it's quick and easy to fill in. I think it's nice to turn the mood tracker into a picture so that you colour a section in each day. It reminds me of the mindfulness colouring books and makes me feel the way I do when I colour a page in the books too. It's a calming and soothing activity even if it's just a 20 second thing at the end of the day. 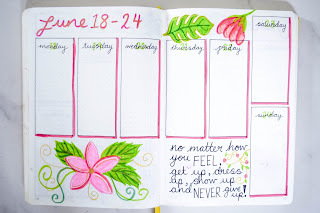 An additional page I added this month was the self-care menu. I took this idea from Pinterest after a bad month. 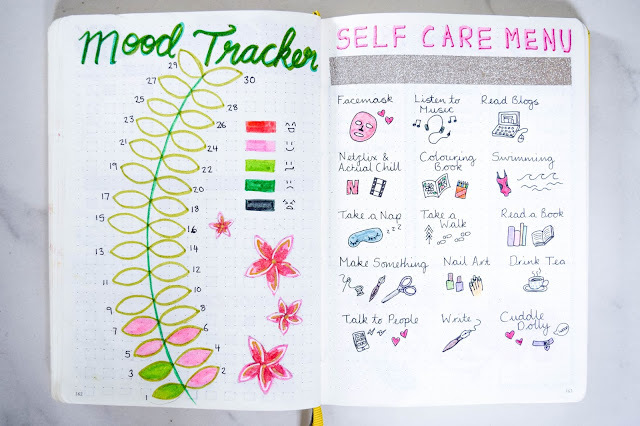 I wanted something related to mindfulness and wellbeing alongside my mood tracker so if I did have a bad day, I'd have some ideas alongside to remind me of all the things I can do to pick myself back up and look after myself. I might keep the idea of a mindfulness/wellbeing page alongside the mood tracker going because it has already been useful this month. 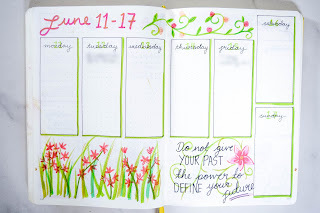 I always toy with the idea of not having the whole week on a 2-page spread. I'm so inspired by other's bullet journals and like to try their ideas but this is one I'm still unsure on. I see others doing their spread over 4 pages but I know I'd soon run out of bullet journal space too quickly. I've still not found my favourite set up yet but at the same time I like switching it up with these spreads. 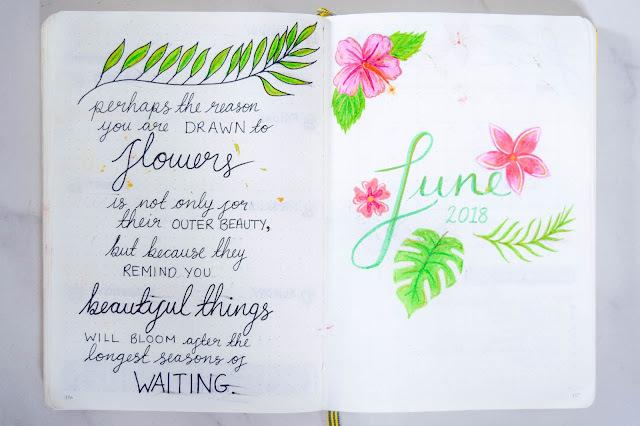 For July, I've gone back to having quotes in each week and I made every page a little different but with the same format. 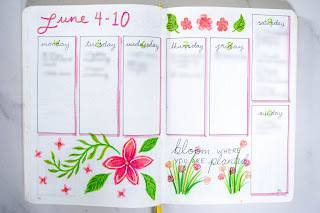 I added different floral drawings to each spread to keep things within the theme and to challenge my artistic abilities!